Another great article by Hasan is a stark reminder about what this conflict is essentially all about: Sunni and Shia forces are pitted against each other for hegemony of the region. IS attacked the Iraqi Shia stronghold of Samarra early this morning. The army has set in a defense overseen by the PM himself. In the meantime the US is re-thinking the wisdom of the spring offensive against IS in Mosul. Mosul Offensive Under Way Despite Leaked Plans? UPDATE: Jihadist militants from Islamic State (IS) have burned to death 45 people in the western Iraqi town of al-Baghdadi, the local police chief says. Exactly who these people were and why they were killed is not clear, but Col Qasim al-Obeidi said he believed some were members of the security forces. IS fighters captured much of the town, near Ain al-Asad air base, last week. Col Obeidi said a compound that houses the families of security personnel and local officials was now under attack. He pleaded for help from the government and the international community. Gregory Sierra, commander, 3rd Armored Brigade Combat Team, 4th Infantry Division, (left) salutes during the playing of the National Anthem, at Fort Carson's Special Events Center. UPDATE: More than 4,000 U.S. troops head to Kuwait as Obama seeks approval from Congress to use military force against Islamic State terrorists. The President has ruled out large-scale U.S ground combat operations. However he has asked for the option to use military force against militants. 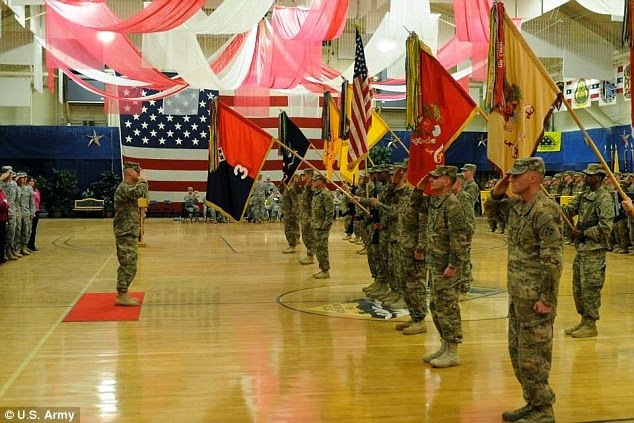 Brigade will become America's biggest ground force in the Middle East. Deployment comes as Iraqi prime minister announces an offensive. Haider Abadi said work had begun on plans to liberate Mosul, the country's third largest city which was overrun by ISIS last June. Who knew? Yesterday saw an "international summit of the Coalition against IS". As we said at the time, this Coalition in practice is meaningless, because no Islamic country except those directly involved, can morally condemn and fight a Caliphate. The totalitarian Muslim state is a central piece of the Islamic faith. World Health Organisation investigating reports militants showed up at Iraqi hospital with lethal disease. Elections over, Obama is stepping up military commitment in Iraq. More boots on the ground, but they're non combat, of course. The coalition has dealt two major blows against the Islamic State. Backed by US airstrikes, the Kurdish Peshmerga are making considerable progress in pushing back the Caliphate fan boys. Of course, Obama gave away the game plan, so IS have gone to ground in their 'capital' Raqqa (Syria). #Iraq; reports also say that dozens more #ISIS militants were killed by IqAF airstrikes on Tal Afar airport & the surrounding area. Frmr US Amb/dor to Iraq: "We Didn't Finish the Job"
This is the conundrum Obama must solve: to fight IS without helping the regime of Assad. Great article on The Federalist on that strategic imperative. But there are more contradictions that must be solved. The West supports international jihad through its direct funding of Pakistan's ISI/Army, the #1 exporters of terrorism. Aug. 7, 2014: "The Spread of the Caliphate: The Islamic State" (Part 1). Above part 2. Part 3. Part 4. Part 5. Also watch the 5 part video "Fighting Back Against ISIS: The Battle for Iraq", published June 17, 2014. The Making Of. The thing is Isis is working with a clear plan. Today's alleged takeover of Tabqa airbase & other advances were strategized, not ad hoc. How To Deconstruct the Caliphate Within? The savages of the Islamic State have beheaded the American photojournalist James Wright Foley. In the video showing off the murder, the killer has a London accent, evidence that IS doesn't do borders, the rule of law, or human morality. In a reaction typical of a world in denial, the New York Post was condemned in a series of meta-articles for showing the video; Twitter accounts were suspended as some call it, for providing a 'platform to ISIS propaganda'. But how is exposing these savages for what they are in any way 'a platform'? It's so much easier to attack the messenger when the actual perpetrator is too dangerous to hold to account. The mass psychology these days is fascinating to behold! Good and bad news: the Kurdish Peshmerga has secured the frail Mosul dam, but failed to take Tikrit from the orc army. The sad thing about this story is that 'moderate' Muslims, rather than condemning IS for atrocities against primarily other Muslims, would rather be dead than disloyal to the collective. Text states: From D'Aggurai, our artillery furious about the mutilations inflicted on (...) took revenge. Original: retweeted 54 times so far. Meanwhile, even Mr. David "Big Society" Cameron isn't having any! Oh, and Al Qaeda is back! Two separate Kurdish demos were held today, one in London and another in Tel Aviv. 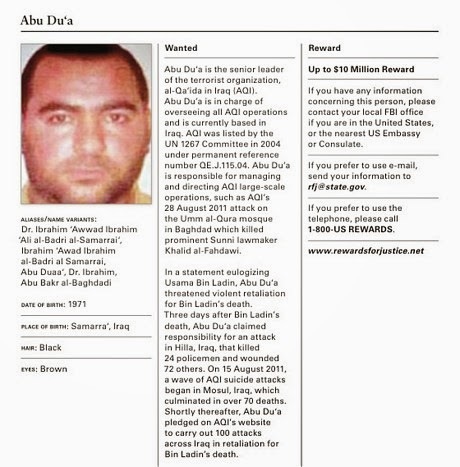 Almost a thousand American military 'advisors' are now on the ground in Iraq. The next couple of days are crucial in the world aligning against the evil forces of the Caliphate. The French and the CIA are already funnelling arms to the Kurds. There are reports in the Aussie media, IS has seized uranium for a dirty bomb. Cardinal Fernando Filoni, Pope Francis' personal envoy arrives in Kurdistan to assess situation of Christians displaced due to #ISIS threat. French Pdt . @fhollande, in agreement with authorities in #Baghdad decided to send weapons in coming hours #Iraq, in face of tragedy in Kur. 6th US airdrop to Mt Sinjar, with 108 bundles of food & water dropped from C17s & C130s, happened tonight, per Central Command. 'Slag van Schilderswijk' door ogen kalifaat http://t.co/LKC5NHfZNZ Kijk je mee, Jozias van Aartsen? Je hebt het niet meer in de hand, hè? Helping and arming the Kurds to the teeth might seem like a no brainer, were it not for fear Iraq might break up along ethnic lines. The people that bring up this argument don't understand there is a hierarchy in principles. Yes, this is important, as we have seen when Russia stole the Crimea, citing ethnicity as the argument. But there are even larger issues at stake here. The survival of ancient minorities, their INDIVIDUAL rights as human beings and the most evil movement in the history of mankind getting a foothold on real territory, with all the wealth and assets that come with it, are at stake The West has been waging wars of liberty on lesser, and the wrong grounds: Bosnia, Kosovo to name but two (read here, why?). In the case of Crimea we did nothing! Ultimately that was against Western interests. How about acting in our interests for once and also end up on the right side of history? Erdogan of Turkey won't like it. But Turkey, along with Saudi Arabia and Qatar are to thank for the existence of IS in the first place. Help the Kurds! Bolton: "Obama Is Wearing Blinders Against IS"
Ambassador John Bolton is weighing in on the situation. Bolton: "Obama is wearing ideological blinders. He can't admit his war on terror is a disaster. I guess for Obama, ISIS is a terrorist group in Iraq and freedom fighters in Syria. For the strategic terror masters the main target of the Sunni onslaught are the Shia. The destruction of other minorities in Iraq is simply a perk to keep their boys happy. But their political masters have created a Frankenstein's monster over which they are rapidly losing control. The anti war crowd have a problem attacking this operation: the altruism aspect is without question. Even the obscure Yazidi sect is brought up by the press so as to de-emphasize the Christian beneficiaries. There's hardly anything to bring to the fore in defense of the Caliphate. Nevertheless, they will think of something to render this mission evil. Grayson goes for the principle of the matter: violence is evil, no matter what the cause. But Grayson is an infamous nut job. Libertarians will probably play the same card (update: yip). The ISIS fan boys are struggling whether to go for "genocide is good" or to choose what they do best - denial - "there is no genocide". 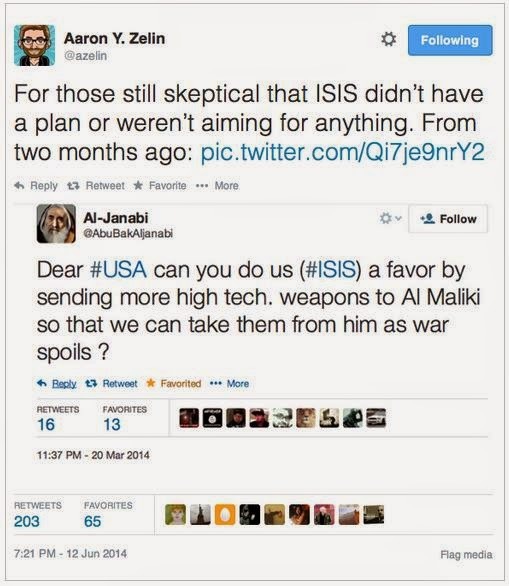 FLASH: ISIS members are calling for attacks on US interests worldwide after start of airstrikes in Iraq. BREAKING: Rudaw reporter: Hundreds of #IS fighters killed and wounded in US airstrikes in #Gwer. IS fighters are already outside Arbil, a major Kurdish city. Aiding Kurdistan should have been a no brainer, even for Obama! IS were bringing artillery into action against Kurdish forces defending the city. #Secdef proud of troops who conducted air drops of supplies to Iraqi's in need. US military will remain ready for airstrikes as authorized. Iraqi Kurdish security sources say Peshmerga killed Islamic State's Ministry of War and regained control of Mosul dam, @Shafaqnews reports. If US action in #Iraq is at all limited (it will be), the Islamic State will reap the rewards. It'll finally be back to fighting "Crusaders"
Guess it IS really happening. Obama wakes up to genocide against minorities! Humanitarian food droppings and airstrikes against the forces of IS which now closing in on Arbil, Kurdistan and moved into Lebanon. In the meantime the General in the video makes abundantly clear that the Kurdish Peshmerga is outgunned against the Caliphate. The Kurds should have received military aid last month! This is a no brainer and truly outrageous! The UN Security Council has started its deliberations. More on the persecution and ethnic cleansing by the Caliphate on the dedicated Live Blog. In the meantime there's the issue if the West ought to step in with aid and air strikes. These genocides are intolerable. In the meantime in Iraq and Syria religious cleansing by the boys of the Caliphate continues unabated. The EU is keeping schtum. In Europe minorities are serving the purpose to hammer the West, but in the Middle East they are of no consideration. Obama has decided to send yet another 150 'advisers' to Baghdad. In Tehran in the meanwhile..
IRGC-AF has transfered all it's operational Su-25 type close air support aircraft to Iraq to be employed against ISIL and it's allies during the ongoing 2014 Northern Iraq Offensive. The seven Su-25 type aircraft are now deployed at Imam Ali bin Abi Talib Air Force Base (ICAO: ORTL / LID: TAL), along with recently delivered ex-RuAF Su-25 type aircraft. (...) The aircraft transfer and support contract is said to provide Iran's IRGC-AF with six Sukhoi Su-30K multirole combat aircraft previously designated for Iraq. It has been further speculated future IRGC-AF Su-30 aircraft will be deployed at BuMusa ("Abu Musa") Island. [source: ACIG.org member] The aircraft transfer deal appears in effect with American acquiescence or approval. Obama's neutral stance of not wanting to "choose one Muslim sect over another" in Iraq is pushing the country out of the free world and into the orbit of Assad, Iran and Russia. So much for smart foreign policy. Iran and the Shia are not sitting idly by while ISIS is making daily gains. There is something going on within #ISIS media department - use #Ramadan to officially announce #caliphate in #Iraq #Syria ? (...) US Secretary of State John Kerry in Jordan Friday laid out another piece of the Iraq-Syria imbroglio. He estimated that the Syrian rebel recruits enlisted from among the nearly one million Syrian refugees sheltering in Jordan could be deployed in Iraq for fighting ISIS. His words were accompanied by the Obama administration’s application to Congress for half a billion dollars to arm and train such a force. President Obama is therefore in the midst of yet another U-turn on the Syrian-Iraqi war scene – this one involving Israel too. Until now, the Syrian rebels undergoing training by US instructors in Jordan were sent into southern Syria to hold a line up to the outskirts of Damascus and act as a buffer between the Syrian, Iranian, Hizballah and Iraqi Shiite militia units and the Israeli and Jordanian borders. Their presence in this sector of the Syrian warfront was to have provided Washington with a bargaining chip against the Assad regime. This operation was run from an underground US-Jordanian-Israeli war room situated not far from the Jordanian capital of Amman. Kerry’s latest statement gave this bunker-command a new war focus and diverted Jordan-based Syrian rebel forces from their mission south of Damascus to contesting the rapidly-advancing Sunni Islamists in Iraq. Our military sources note that these forces – albeit with full US-Jordanian-Israeli intelligence and logistical back-up - were not an outstanding success in their Syrian mission and should not be expected to do much better in Iraq. Secretary of State John Kerry is attempting to enlist “moderate” Syria mercenaries to battle against ISIS in Iraq. News of Kerry’s effort follows an announcement on Thursday that the Obama administration has asked Congress for $500 million for groups fighting both the al-Assad regime in Syria and ISIS and other radical jihadist groups in Iraq. Christians in the West are simply not a category. They aren't seen as a valid minority because in the West they are not. They are in the Middle East, but somehow that doesn't count. Which just goes to show that the Left doesn't support minorities as they claim. They are simply against everything that broadly represents The West. What a Caliphate would mean for the West. Alan West and Lt.Gen. Tom McInerney talk to Sean Hannity about the situation in Iraq. Contrary to John Bolton on Saturday (top video), they advocate airstrikes against ISIS, followed by mopping up operations on the ground. 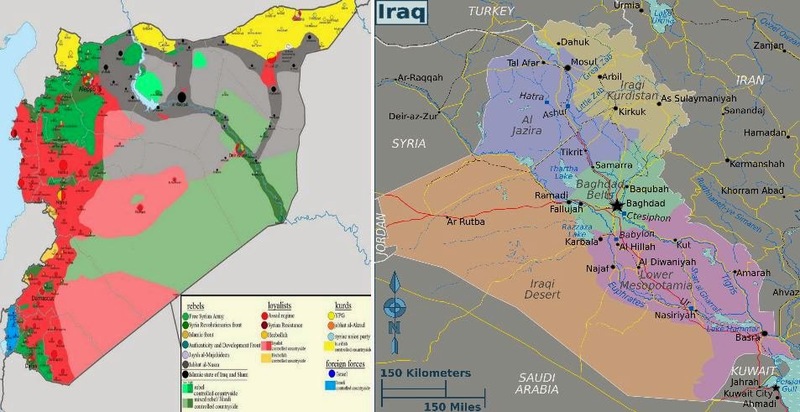 ISIS is expanding its territory while consolidating its gains. After taking two more border posts in western Iraq this weekend, an Iraqi security official has confirmed that a border post near Jordan has fallen to ISIS fighters. Consequently, the ongoing crisis has expanded to within 100 miles of two U.S. allies. ISIS now claims to control all Iraqi border posts with Syria and Jordan. Given the mobilization of Shia militias in and around Baghdad, it appears that the spreading sectarian chaos will only get more intense. "#AlQaeda is old news - get ready for #ISIS backlash" @QuilliamF's @MaajidNawaz writes for @DailyMailUK. Read here http://t.co/ftgbrAWhQ7. Megyn Kelly talks to Ambassador John Bolton and author Andrew McCarthy (June 21, 2014). Bolton: At this time the West has no stake in Iraq. BREAK! SADDAM'S WMD PLANT EXISTS AFTER ALL! It's not the first time this facility surfaces. It's just that the media refuse to report it. Behind the scenes Sistani has sent a powerful private message to Maliki. It is a game changer. And no, I'm not going to tweet about it. ISIS rounding up Iraqi loyalists. Obama has just said how he intends to approach the crisis in Iraq: as a morally neutral conflict mediator. He refuses to choose one Muslim sect over another. "There is no military solution to this problem", he's said. So Obama is sending 300 military advisors and John Kerry, who now ends up stuck in Iraq. The cause of terrorists in the Obama playbook is inequality. So, if Maliki can be nudged into behaving like a non sectarian, the problem is solved. The statement is full of postmodern contradiction. But in effect, Obama is calling for regime change, because the Sunni side is much stronger than the Shia forces. Turkey opposes possible US strikes on militants in Iraq. http://t.co/78qGmceeOH #Iraq killing our friends? Oh no! ISIS links to old regime: A retired former Iraqi army officer, Colonel Hashem al-Jammas was appointed by the militants as governor of Mosul. It's Bilal Erdogan, son of Tayyip of Turkey! The confirmation comes as the Iranian president, Hassan Rouhani, said Iran was ready to support Iraq from the mortal threat fast spreading through the country, while the Iraqi prime minister, Nouri al-Maliki, called on citizens to take up arms in their country's defence. (...) 1,500 basiji forces had crossed the border into the town of Khanaqin, in Diyala province, in central Iraq on Friday, while another 500 had entered the Badra Jassan area in Wasat province overnight (...) the head of the Iranian Revolutionary Guards' elite Quds Force, had arrived in Baghdad to oversee the defence of the capital. Shi’te Muslim Iran is so alarmed by Sunni insurgent gains in Iraq that it may be willing to cooperate with Washington in helping Baghdad fight back, a senior Iranian official told Reuters. 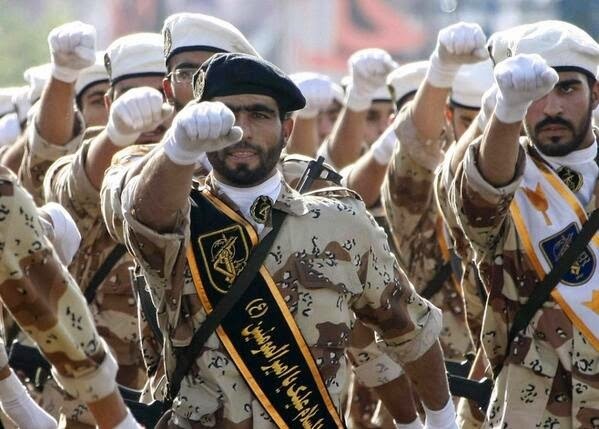 The elite Quds Force of Iran's Revolutionary Guard. The idea is being discussed internally among the Islamic Republic’s leadership, the senior Iranian official told Reuters, speaking on condition of anonymity. The official had no word on whether the idea had been raised with any other party. Officials say Iran will send its neighbour advisers and weaponry, although probably not troops, to help its ally Prime Minister Nuri al-Maliki check what Tehran sees as a profound threat to regional stability, officials and analysts say. Islamist militants have captured swathes of territory including the country’s second biggest city Mosul. Tehran is open to the possibility of working with the United States to support Baghdad, the senior official said. Obama's foreign policy has weakened Iraq, strengthened Iran, angered Saudi Arabia, sent Egypt & Libya into chaos, and endangered Israel. Deployment of two Iranian Quds batallions hasn't made any difference. A full scale battle between Sunni and Shia forces is now under way. The West is torn: the parties they are supporting in Syria are the enemy in Iraq. So much for postmodern foreign policy. BREAKING: Germany urges citizens to immediately leave 3 Iraqi governorates, Baghdad. Thousands of men arrested by ISIS walk through Tikrit hands behind their heads, alledgedly security forces. But part II is clearly showing these are just civilians. According to sources ISIS has vowed to press on to Baghdad. A spokesman has said ISIS has an axe to grind with the central Government. He said the group will also march on the sites of Shiite shrines, the cities Najaf and Karbala. Which may have prompted Iran to send special forces into Iraq. The Iraqi Parliament meanwhile has voted against imposing the state of emergency. The New York Times has reported that the Iraqi Government requested the US last month for more military support. PM Nouri al-Maliki secretly requested air strikes on positions of Sunni fighting forces. But the White House declined since Obama considers the war in Iraq to be 'over'. Foreign Affairs Minister Hoshyar Zebari proposed deploying US drones as early as last year. But Obama declined the invitation. The maps of the wider region show that indeed this assault was in fact rather predictable. 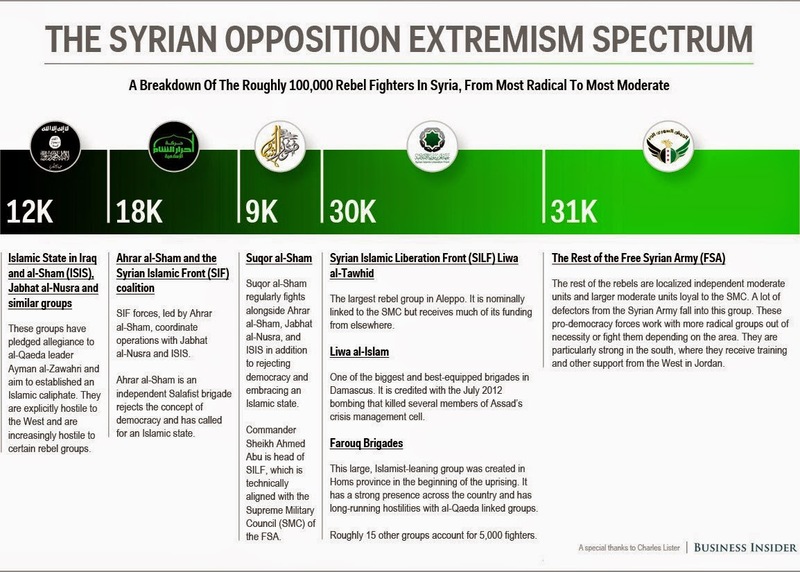 This means the proxy war is potentially turning into a full scale epic war between Shia and Sunni Islam. Report: Turkish truck drivers released by ISIL, but taken hostages by another group. Sources: Turkey rules out military option to secure release of diplomatic staff taken hostages by ISIL, priority is safety of personnel. ISIS rules: Ppl u tried secular rulings (republic, Baathist, Safavides) &it pained u. Now is time 4 Islamic state Imam Abu Bakr El Qurashi. The only system they haven't tried is Liberty. But that would be evil, so it isn't even considered. A day after taking over Iraq's second-largest city, Mosul, militants gained nearly complete control of the northern city of Tikrit. Known for its ruthless tactics and suicide bombers, ISIS has already controlled the Iraqi city of Fallujah for five months, and is also arguably the most capable force fighting President Bashar al-Assad inside Syria. Mosul’s relative absence from the news headlines belies its status as one of Iraq’s most enduring insurgent strongholds. The loss of the city, home to around one million people, is potentially a huge challenge to the Iraqi government, which has been struggling to quell a regalvanised al-Qaeda insurgency for more than two years. With 50Turkish hostages in hands of ISIS it seems highly unlikely that Turkish jets are pounding ISIS around Mosul; as was reported by some. ISIS heeft luchtmacht RT @jenanmoussa If true this is HUGE. ISIS activist claims that "at this moment an ISIS plane is flying above Mosul"
Heavy fighting erupted inside Tikrit -- the hometown of former Iraqi leader Saddam Hussein -- as the military tried to regain control of the city. Two police stations in Tikrit had been set on fire and a military base taken over by ISIS. The governor of Salaheddin province, of which Tikrit is the capital, was missing. Suspected ISIS militants raided the Turkish Embassy in Mosul on Wednesday, capturing 48 people, including diplomats. They also seized parts of Baiji, the site of Iraq's largest oil refinery. Meanwhile, explosions struck three Shiite areas in Baghdad on Wednesday, killing 25 people and injuring 56. The deadliest attack was in Sadr City, where a car bomb exploded near a funeral tent, killing 15 people and wounding 34, police said. Residents are fleeing Mosul. Thugs of ISIS are roaming the streets in pickup trucks. Smoke plumes are visible everywhere. Reports that Shia militias are being deployed in force on outskirts of Baghdad to prevent an assault by ISIS. Maliki can't trust the army. That's where it will eventually end without intervention. But something is wrong with this picture. It assumes the wars in Iraq and Aghanistan were in good hands with the Obama. But it was he who dropped the ball. 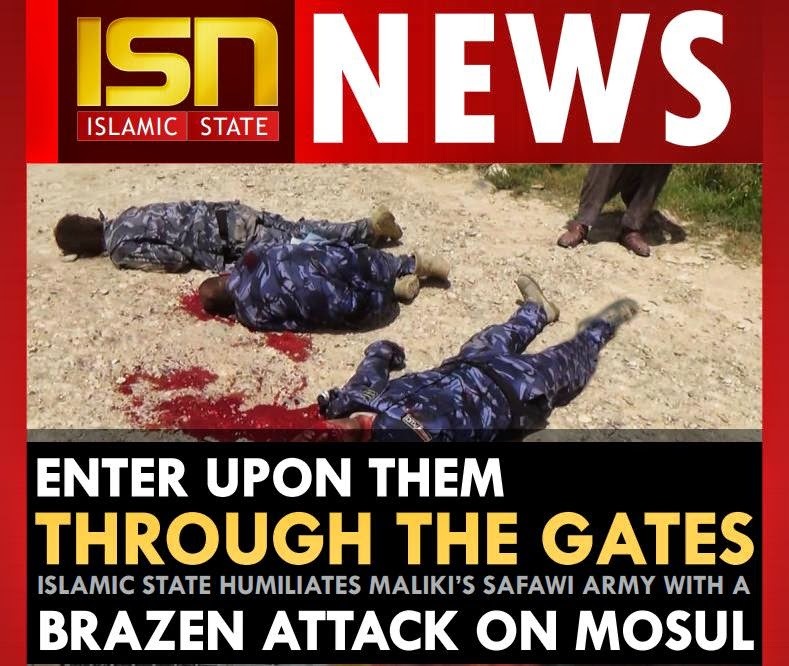 ISIS has reached Saddam's home town of Tikrit. Government forces have started to attack Falluja. Heavy bombardments are reported. 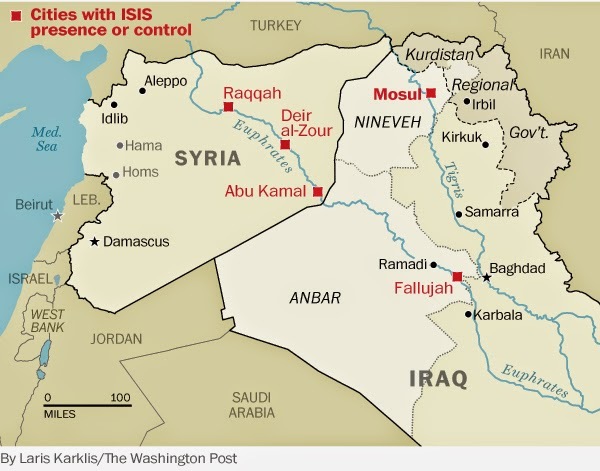 ISIS now control one tenth of the territory in Iraq, approximately the size of Portugal and 3,5 million inhabitants. Washington is having hearings on the Bergdahl swap. The news this morning shed some light on two mysterious tweets posted yesterday. Reports that the fall of Misul to ISIS is an inside job. To be confirmed. The nation state and borders are Western constructs on an area that once was the Ottoman Empire. To understand the situation on the ground we must look beyond state lines. This map of Syria (left) shows the sectarian division on the ground. It makes clear how ISIS could overrun Mosul as easily as it did: ISIS already controls the western side of the border (present situation). #Iraq #Mosul: #ISIS managed to recover 500 Bn Iraqi Dinars from governmental institution according to Iraqi Government sources. @Glokta91 Yes but irrelevant here. Military equipment are moving form Iraq to Syria. That is the point. #BreakingNews""""""""""""" #Iraq: #ISIS enter Salaheddine province and engages in a battle NOW. Is it the beginning of Dawla (State)''''''?? MOSUL, WHAT DOES IT MATTER? The spokesman of the Kurdish People's Protection Units (YPG) confirms the rumor that the Kurdish army has taken Rabia, is incorrect. @hahussain Not all of them are Arabs! Mosul is an multi cultural city,Kurds,Arabs and Assyrians. Get a book about that area ASAP!!! BREAKING: #Iraq: ISIS claims to have seized al-Qayara, al-Shura, al-Sharaqat, Zamar, Ba'aj, al-Mahalbiya and Jaban in Ninawa province. @sadchazz @EAli1 @THE_47th yes, include now ppl that came from Istanbul by car/bus. Plus Syrians joining ISIS or JaN. Huge fighting force! When I tell you ISIS now control's Iraq's 2nd largest city: think of the banks, airports, depots, equipment, arms, assets they now have. Defenses collapsed in Mosul. Residents are throwing stones at Iraqi army as they flee the city. The central government is dominated by Shia. Karachi airport for a second day under attack, mass kidnapping of university teachers in Afghanistan, 5 ISAF forces killed, Mosul under control of extremists: this is the result of Obama's leading from behind. Postmodernists have no concepts, certainly not of the nature of power. Once your leave a vacuum, the most assertive forces step into it. The Middle East, far from becoming an oasis of peace and democracy is falling to extremists. Mosul has officially fallen. The question is, will the Kurdish Peshmerga join forces with the central Government in Bagdad or go it alone?